Well, I am planning to contribute to the small group of thoughtful and committed citizens that are surely making a difference. Here, at Osa Conservation, I see this effort in progress. Osa Conservation’s mission is to conserve the land they own of the 2.5 percent of biodiversity we hold in this tiny spot of the world, in the Osa Peninsula, Costa Rica. That is amazing. What some people do not realize is everything is connected and has a ripple effect on all of its surroundings. 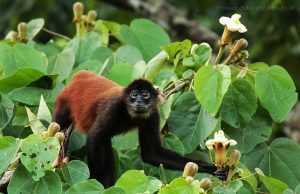 For example, the spider monkeys play a vital role in the health of the rainforest. They disperse 90-95 percent of their seeds that benefits themselves, the tree species, and other organisms feeding on that tree. 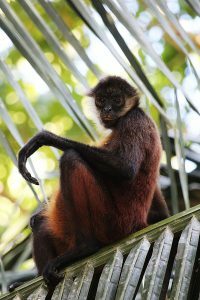 I am mentioning their contributions because the research I am doing on the property of Osa Conservation a short- term study on the black-handed spider monkeys (Atelesgeoffroyi). My goal is to look at their feeding habits and spatial patterns according to food availability and patch size of the trees they are eating. This project will continuously be added to throughout the wet season and dry season for better understanding of their feeding ecology. 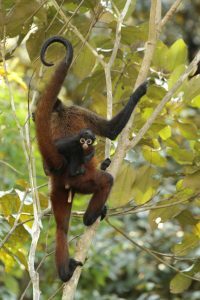 Ultimately the results will help us (the author and co-authors) and Osa Conservation better understand how to conserve the population of black-handed spider monkeys in the Osa Peninsula, Costa Rica. I would not be here if it was not for DANTA: Association for Conservation of the Tropics. DANTA, a field school run by Dr. Kimberly Dingess, is a non-profit organization with a mission to educate students and locals on methods of conservation of the tropical rainforest. I took her course, Methods in Primate Behavior and Conservation in January of 2015 and we stayed at the Piro Biological field station. This experience ignited my passion to pursue this project and learn more on the primates on the land of Osa Conservation. DANTA is an amazing way to get a head start on field work experience and knowledge on such important issues. In addition to the contributions I have felt I made during my 2 week stay, I learned so much from the staff at Osa Conservation. It is incredible to see each and everyone one of the employees come from such diverse backgrounds for a joint effort. They work together, play their role, and never forget the mission of Osa Conservation. It is fairly easy to say I have learned a decent amount from the staff since I have been here. For example, a sea turtle research assistant, Charles Wheeler, allowed me to join him one morning in patrol, release, and excavations of the sea turtle hatchery on Piro beach. He taught me so much about the work he does and how the program he works for has been able to conserve the population of 4 different species of sea turtles over the years. It was amazing to witness the effects just a few people can have on the conservation of sea turtles in the area.